The scrot shows a bug in the Paper icon theme (maybe? Or in tint2?) where Paper is confused as to which folder icon to use for tint2. I've even seen no icon displayed. They should all look like the second one down. I was getting the same problem on Hydrogen/Jessie, but it's reappeared on Helium/Stretch. Folder/Thunar icons in tint2 are sometimes wrong, and sometimes just missing. It's a sporadic issue, so hard to track down, but it might be a bug with the Bunsen-Paper icon theme, or Paper icon theme (which ours inherits), or Thunar, or Tint2. Trying other icon themes, or file managers, or panels should pin it eventually. One thing to try if anyone notices this happening: use Alt+Tab and see what icon is being displayed in the popup window. If it's the same as in tint2 then it's not tint2's fault. In both installations (386 and amd64) the display is correct. use Alt+Tab and see what icon is being displayed in the popup window. If it's the same as in tint2 then it's not tint2's fault. See the folder icons at the bottom left? One is a generic folder, but the other is a "home" icon, even though the file manager is in "git". The Alt+Tab popup shows the correct icons. Does this problem occur if the bl-tint2-session abstraction is removed and replaced with a straight `tint2 -c /path/to/configuration_file` call instead? Perhaps replace the other bl- abstractions also. Well, there's your answer... The Beast is causing it. 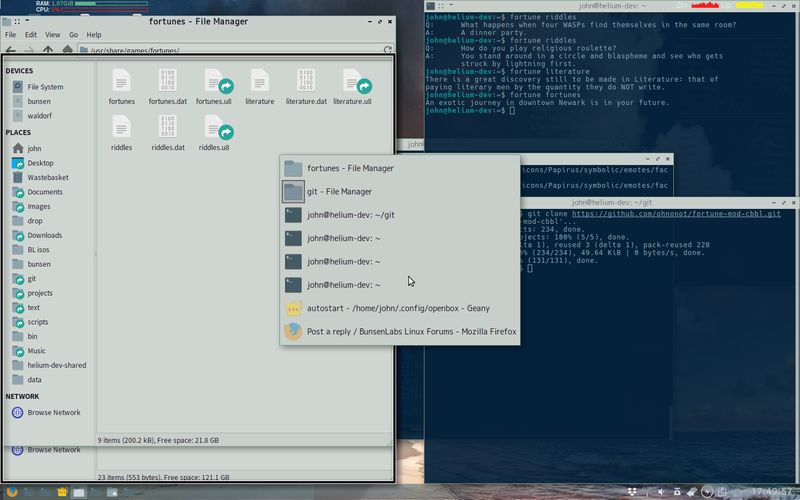 I'll try xfce4-panel and see if it happens there too. Using this panel seems to have cured another bug I've seen where a terminal window will open behind another window (and do it's alert red-flash border thing) if there is another terminal already open. another bug I've seen where a terminal window will open behind another window (and do it's alert red-flash border thing) if there is another terminal already open. I've sometimes got this when opening Thunar - when Firefox is open, the new Thunar window opens behind. Only occasionally though. Are you using the default Stretch tint2? Maybe upgrading to the backports version will fix these - haven't tried that yet. Damo's tint2 manager is just a convenience for handling multiple tint2 profiles; tint2 is ultimately launched the same way. some people don't take well to being presented with a link instead of a problem description. maybe, in addition to what you already put there, you could put together the most relevant bits from this thread and post them there? Now running tint2 16.2-1+deb9 and the issue seems to have gone away. A case for moving that package from backports to our default repo? (It supports some new syntax in our tint2rc also.) It would be an exception to our Debian-Stable-by-default rule though. @ohnonot, good idea, I've added a summary there. But anyway, it looks very much as if the issue was with tint2, not the icon theme - or at least a combination of the two. It seems fixed by a tint2 upgrade from the BL stretch-backports. Anyone confirm this? I'll close the bug at GitHub for now, we should leave this thread for a week or so and then label it RESOLVED if there are no more reports. I haven't gotten any unfocused terminal windows so far, either. Just had a Thunar window opening under Firefox, and earlier something under leafpad, so that might be an unrelated issue, maybe openbox, or the individual apps? 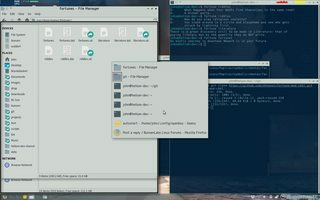 Try using xfce4-panel or lxpanel for a while and see if it happens. It might have to do with the icon size setting in tint2. With the backport version, I haven't had it happen yet, but I'm not using our default tint2 and I playing with icon size before the upgrade at least fixed my issue of no Thunar icon appearing. I don't really see how a window stacking issue could be the fault of the panel, though. In order to troubleshoot, I would tail -f ~/.xsession-errors for a bit and see if it throws that warning when the icons disappear. Unfortunately, I have moved off of Thunar and back to pcmanfm for a bit because Thunar likes to lock up when an editor opens a temporary file in the working directory that Thunar is pointing too, so it might be difficult for me to diagnose, although the above-mentioned ~/.xsession-error spam continues, even with pcmanfm installed (the whole locking up thing doesn't happen with pcmanfm though). A reported bug, and the dev is stubbornly marking it Won't Fix. Delete the two Paper 512x512 folders and the errors stop. I haven't investigated if it's pertinent to the issues in this thread. I think this is actually a fairly minor bug. It would be nice if our defaults worked perfectly, and I think we should keep striving for that, but changing the icon theme, and the other themes and the wallpaper, is encouraged. Those are really huge icons and I can't see why the need for such large icons unless using a HiDPI screen. We do offer an HiDPI theme-set OOTB. Those are warnings, they won't hurt anything except for slowly making the errors file larger. There's a way to lock the .xsession-errors file so it won't grow, but I can't remember how ATM. Also, I don't get those errors using xfce4-panel. (firefox:1543): GLib-GIO-WARNING **: /home/rachel/.local/share/applications/defaults.list contains a [Added Associations] group, but it is not permitted here. Only the non-desktop-specific mimeapps.list file may add or remove associations. (bl-file-manager:2312): GLib-GIO-WARNING **: /home/rachel/.local/share/applications/defaults.list contains a [Added Associations] group, but it is not permitted here. Only the non-desktop-specific mimeapps.list file may add or remove associations. I'm going to remove references to 512x512 icons from Paper's index.theme and try again. The "erratic folder icons" issue hasn't shown up once for me since upgrading tint2. Can I mark the title [resolved] and open a new topic on whether to use the backports tint2 by default or not? Other issues are distractions IMO and should be the topics of new threads if important enough - for example the window stacking thing. Otherwise, what posters are talking about when they say "this bug" is not absolutely clear. Absolutely. I haven't had any issues either, and the Gdk warning messages are harmless. @johnraff, do the honors, I'm seeing a (weather) storm here, exciting!